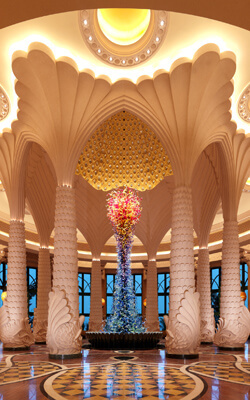 The environment of the Imperial Club Lounge at Atlantis, The Palm is unique and has many qualities you won’t find at other hotels. Aimed at guests seeking luxury with extra benefits and exclusive privileges, Imperial Club offers the ultimate exclusiveness and makes every journey memorable with benefits designed to indulge its guests. 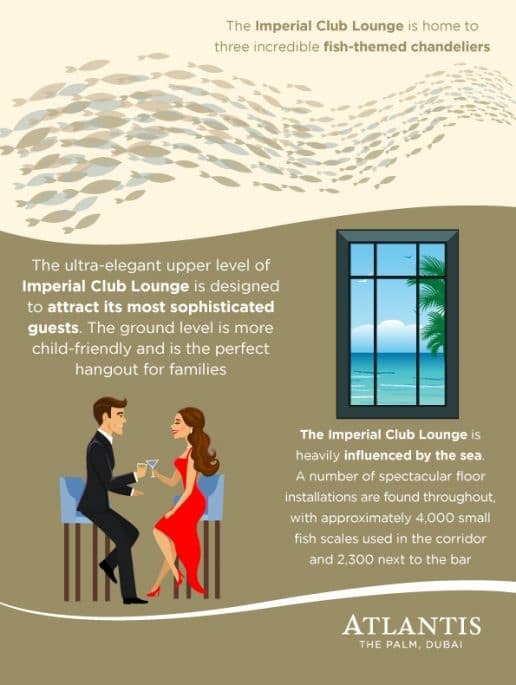 Imperial Club is available exclusively for guests staying in Imperial Club rooms and suites. The exclusive benefits enjoyed by guests include, luxury round-trip airport transfers in luxury cars, access to exclusive Imperial Club Beach; overlooking the Dubai Marina Skyline, complimentary session at the Kids Club, and a range of Concierge services throughout the stay. Imperial Club combines unforgettable experiences with the bliss of an all-inclusive Dubai holiday, offering an all-encompassing, luxury experience to the most savvy luxury lovers. Guests get to eenjoy two relaxing spa treatments for the price of one at the award-winningluxury spa in Dubai, which offers the ultimate wellbeing experience and features a variety of relaxing amenities including couple’s spa treatment rooms. Imperial Club guests enjoy full access to the 3,091sqm Imperial Club Lounge, a luxury retreat spread over two floors with a beautiful outdoor terrace, which boasts expansive sea views. Awe-inspiring artworks made exclusively for the Imperial Club by Paris-based designers Muzeo adorn the interiors of the lounge. 5. 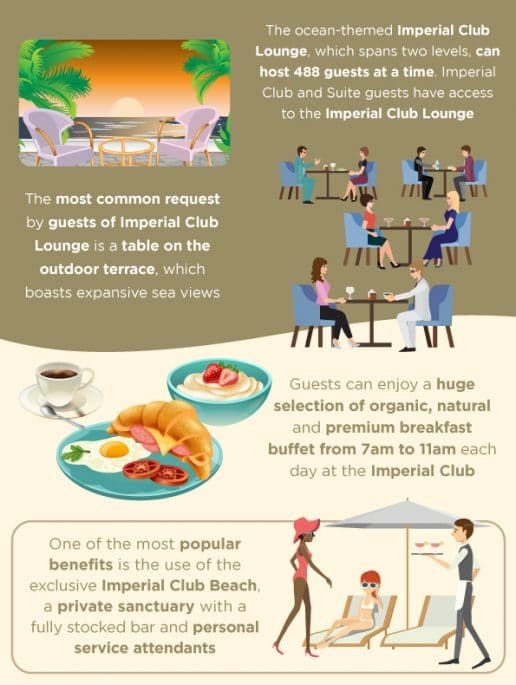 The most common request by guests of Imperial Club Lounge is a table on the outdoor terrace, which boasts expansive sea views. Located on the upper level floor of the Imperial Club Lounge, the chic outdoor terrace offers stunning views across the Dubai skyline and the Arabian Gulf. There are 128 seats in the outdoor terrace, with 359 inside the Imperial Club Lounge. From complimentary breakfast and afternoon tea to evening drinks and dinner, guests can enjoy world-class dining in the exclusive setting and convenience of Imperial Club. Afternoon teal along with mid-afternoon treats are available from 2pm to 4pm each day. The most popular bite is the turkey and leek quiche, and Mojitos are the most popular cocktail during the daily happy hour from 5pm to 7pm. The Imperial Club experience features exceptional service and incredible attention to detail, from a fully stocked bar to personal service attendants,to deliver personalized service that caters to guests’ unique needs while stimulating their senses. Awe-inspiring artworks made exclusively for the Imperial Club by Paris-based designers Muzeo adorn the interiors of the lounge, which also features a kids’ hangout area to keep the little ones entertained. The upper level of the lounge is designed for guests looking to unwind and has a sophisticated cocktail bar vibe. The sea-inspired interiors of Imperial Club Lounge use soft golds, white and blues to brilliant effect. Some areas of the lounge use similar colour palettes but are styled slightly different to each other. The idea comes from the concept of how different schools of fish travel to different areas of the sea. 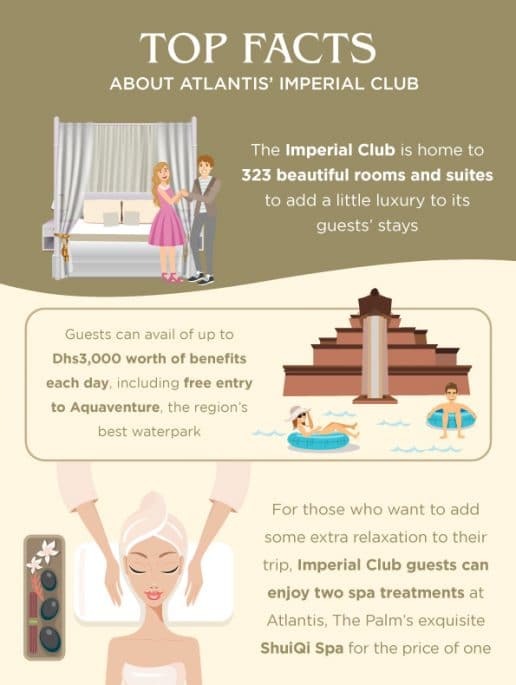 Get to know the new Imperial Club and experience these exciting offerings for yourself by taking advantage of the Imperial Club Sale that lets you add a little luxury to your next holiday with up to 25% off Imperial Club. 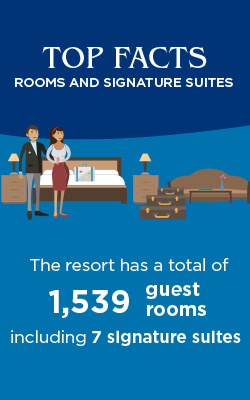 You can even snag a free upgrade from an Imperial Club King Room to an Imperial Club Queen Room! 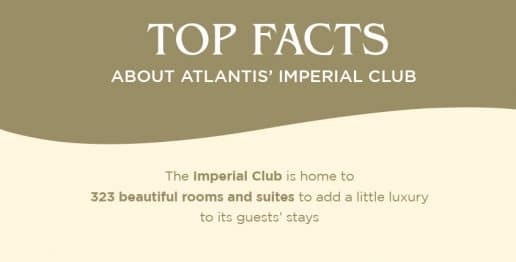 If you’re more of a visual spirit, then feel free to look at the full Atlantis Imperial Club Top Facts Infographics.